"1914 Peerless Chemical and Hose Wagon (Greenwood Hose 3) 1914 Peerless Squad Wagon 1914 Peerless Ladder Truck. 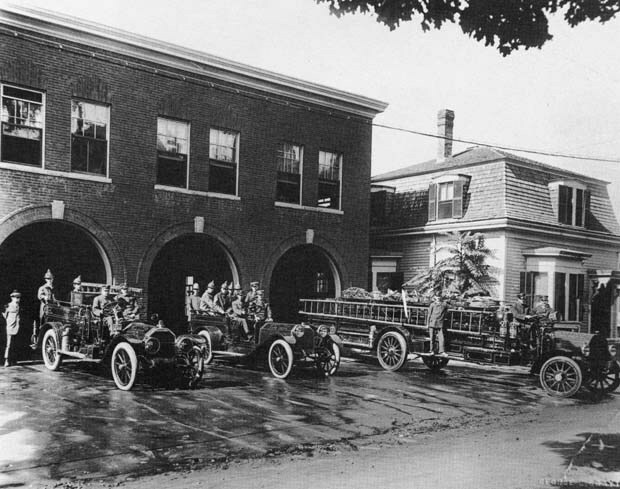 In September, 1914, three new pieces of motor-driven fire apparatus were delivered to Wakefield from the Peerless Motor Company of New England at a cost of $6,445.16. With extra equipment and painting, the total cost was $7,392.69. The 1914 Peerless city-service ladder truck was the first apparatus to arrive in Wakefield on Sunday, September 12. Thirty minutes after its arrival, it responded to Box 112 for a fire which heavily damaged a dwelling on Forest Road. The new ladder truck was placed in service on Monday, September 14, as Ladder 1, the Town's first motor-driven ladder truck. The three ton truck had a four cylinder gasoline engine and carried nine ladders with lengths from 15 feet to 65 feet in a single bank. The new ladder truck replaced the horse drawn 1892 Abbot-Downing ladder truck which was discarded. On Friday, September 18, a 1914 Peerless chemical and hose wagon was placed in service as Greenwood Hose Co. 3, replacing the horse-drawn 1906 American LaFrance combination wagon, formerly of the Steamer Hose Co., which was placed in reserve at the Greenwood Fire Station. The four cylinder gasoline engine wagon carried 1000 feet of 2 1/2 inch hose and was the first motor-driven apparatus in Greenwood. On Tuesday, September 22, a 1914 Peerless squad wagon arrived and was immediately placed into service. The six cylinder gasoline engine wagon had a long bench seat in the rear for personnel to ride and was designed to tow the 1907 Amoskeag steamer when needed. With the 1912 Webb pumping engine, all apparatus at the Crescent Street headquarters was motorized. Only Montrose Hose Co. 4 remained horse-drawn. As a result of the arrival of the motor-driven apparatus, the entire team of six horses (one pair from Greenwood and two pairs from the central fire station) were transferred to the MLD and the highway department." -- Text from calendar by Jayne M. D'Onofrio. Photo courtesy of Murray Young. “Wakefield Fire Department, 1915,” NOBLE Digital Heritage, accessed April 22, 2019, https://digitalheritage.noblenet.org/noble/items/show/7126.